Home » News » Uncategorised » Sleepout fundraiser reaches £5,000 – help us get more? Sleepout fundraiser reaches £5,000 – help us get more? 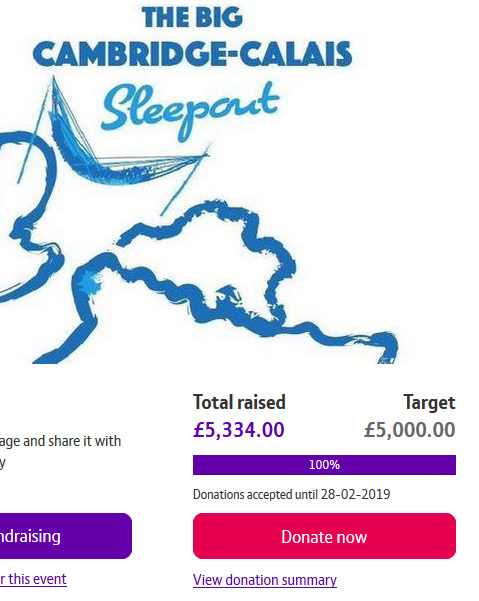 Thank you to everyone whose generosity pushed CamCRAG’s online fundraiser for the Sleepout past our initial target of £5,000 today. How much more can we get? In 24 hours our brave volunteers will be sleeping in and outside St Giles Church and they would love to see sponsorship coming in throughout the event. Join us at St Giles on Saturday 26 January from 1.30pm for some soup and a hot drink, to browse the stalls selling cake, crafts and CamCRAG’s homemade ponchos, take part in the raffle, and talk with our volunteers about what the charity does and how you can get involved. At 4pm there will be speeches from; Douglas de Lacey (Chair of South Cambridgeshire District Council), Elliot Harris (Chair of CamCRAG) and representatives from The Whitworth Trust and Refugee Community Kitchen: The latter supply hot food to refugees in Northern France and homeless people in London.